When I open Chrome, I get the error message in the title. I'm given an option to restart the browser or get help. On the help page (https://support.1password.com/kb/201707/) there are instructions for Opera, Chrome Canary, and Vivaldi but not just Chrome. 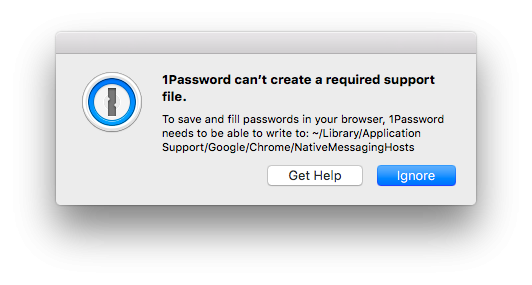 **1Password can’t create a required support file. There are no files in that directory. Any thoughts on how to get this working again would be appreciated! On another support page (https://support.1password.com/cs/native-messaging-chown/), I found a fix that seems to address the issue by changing the owner of the NativeMessagingHosts directory from root to $USER. If this is not the correct thing to do, please let me know otherwise all is working again. We're working on streamlining the processes for transitioning to native messaging and appreciate you reporting your experience with it. Sorry for that extra bit inconvenience and let us know if you run into any other trouble. Cheers! Enjoy the rest of your weekend and have a great week! Oh, and a bit belated welcome to the forum! I am getting the error 1Password can’t create a required support file. I follow the instructions and copy and paste [command removed by AgileBits; it's available in the support article] and when I enter my password, I get this message "no such file or directory"
how do I go about resolving this problem. I get this message "no such file or directory"
It's normal for that to happen when one of the directories doesn't exist, for Chrome or Firefox, because you're not using that browser. Did you follow the remaining steps in the support article and are still having trouble? On behalf of @sjk, Thanks for letting us know.